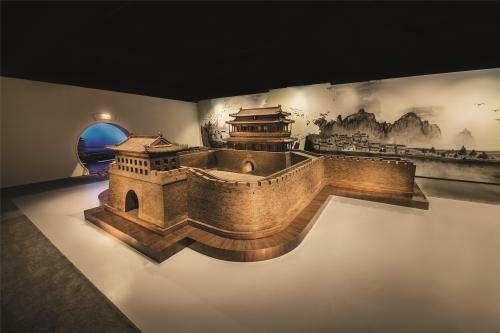 The nostalgia for old Beijing has inspired Chen Lihua, a Beijing native and curator of the China Red Sandalwood Museum, to spend 10 years recreating replica ancient walls and gate towers using red sandalwood and dark woods. Into her seventies, Chen still cannot forget the lost buildings where she spent her childhood climbing up and down such as the gates of Pingzemen and Dongzhimen. Back in 2008, the idea to bring city walls and gate towers back to life in wooden models struck Chen, who resolved to put the ambitious plan into practice despite her family's disapproval. "It is an arduous task to collect all the 16 city walls' blueprints and negotiate repetitively with the experts involved," Zhao Yong, Chen's son, recalled. As Chen embarked gallantly on her program, she was setback by the missing blueprints, critical to recreate the replicas of the ancient buildings using a scale of 10 to one. In addition to resorting to the cultural relics bureaus, she also searched, at a high cost, for old photos and leftover documents from overseas collections. She worked day and night to solve the challenges the workers had encountered while working on the blueprints, referring to books, documents or preserved ancient architecture, like those from the Palace Museum. After countless sleepless nights during the ten-year period, she and her teammates completed their mission by displaying 16 models of the age-old city walls and towers constructed using mortise and tenon joints, a traditional Chinese architecture which doesn't use nails. "It resembles the walls, towers and domes in all their detail. It would be just the same as the original if it was the same size," said Liu Dake, a research fellow of ancient architecture. "This is a splendid work," said Shan Jixiang, curator of the Palace Museum, who believes the project offers a new perspective for people to appreciate Beijing. After starting the new program to restore ten watchtowers once overseeing the city in four different directions, Chen said: "As long as we try our best to make people appreciate the legacy of Chinese culture and put our commitments into action, we are ensuring that our culture can be sustained for generations to come."